An Indian woman wearing a skirt with cut-out hemline and holding a feathered lance stands next to a horse with saddle and decorative shield. One label reads,"Shield of Bigfoot," and the other, "Ollie." The depiction is likely Kiowa, and not Comanche or Cheyenne, based on interpretations of the woman's attire and regalia gleaned by Barbara LaMont in correspondence with several Plains Indian authorities. 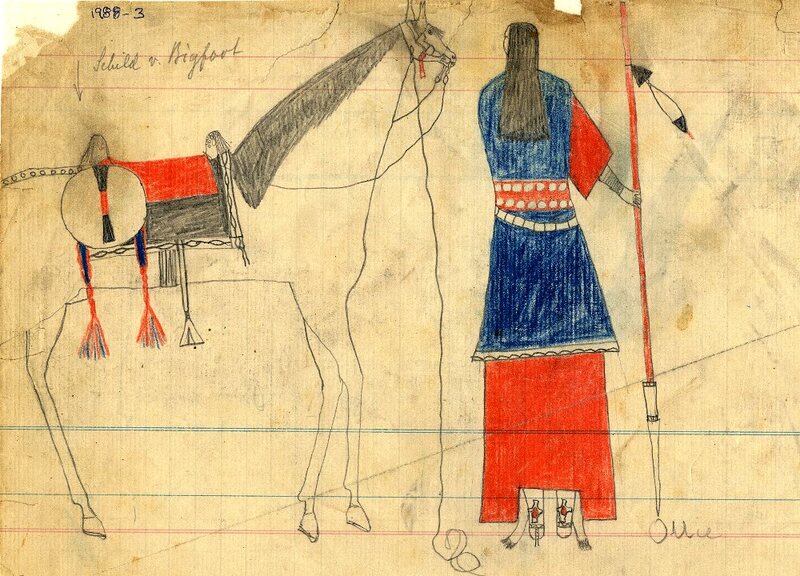 Father Peter Powell, who examined a copy of the drawing, suggested a Kiowa identification based on the long, rolled fringe and star design of the leggings, the small size of the horse's head, which he considers a Kiowa trait, and the lance, which he says a Cheyenne would not allow to touch the earth. LaMont notes that Kiowa artist James Auchiah identified the equipment as the shield and medicine lance of a Kiowa Sun Dance Priest, and that the fringe is braided hair. Mildred Cleghorn, a tribal leader of the Fort Sill Chiricahua Apache who made authentic Indian costumes based on period pieces, pointed out that the moccasin and legging construction was not Comanche. TARL Archives.